Prepare two boxes of brownie mix, according to packages directions or two of your favorite brownie recipes (that would be baked in a 9″ x 13″ pan). Bake prepared brownie batter in a 12″ x 18″ x 1″ (half sheet/jelly roll) pan. Hint: for baking time, I started with the baking time for a 9″ x 13″ pan and added about 5 minutes). Make frosting – I used one batch of Cream Cheese Frosting. Use about 1/4 cup of frosting in a decorating bag fitted with a small round tip (#3) to draw “X’s” and “O’s” on the pretzels. Color the remaining frosting green (Americolor – Leaf Green gel food coloring). Frost cooled brownies using green frosting. 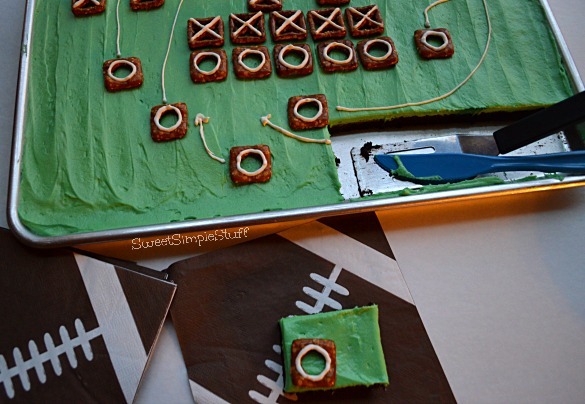 Place the X and O pretzels on the brownies to resemble a football play. Use white frosting to draw directional lines/arrows. Have you heard about cutting brownies with a plastic knife? I learned this trick and always make sure that I have one handy … it works! What’s your favorite Super Bowl party food? I have a weakness for guacamole and chips! 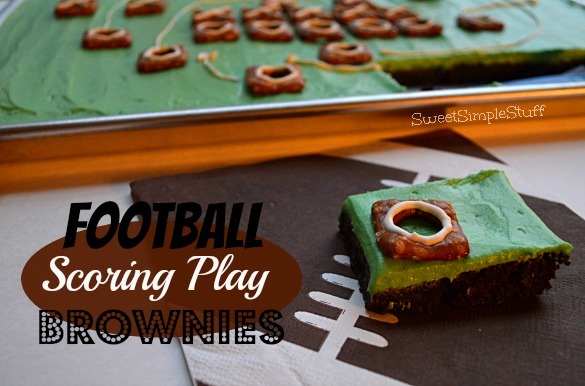 Those tic tac toe pretzels are perfect for your brownies. It’s such a fun and easy idea. Thank you Beth 🙂 I love easy! Thank you Colleen 😉 Love it … my own football play! 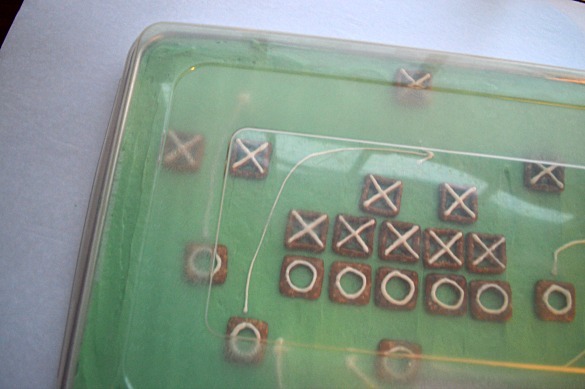 Where can I find Tic Tac Toe Pretzels!? So cute!! , I bought the pretzels at target, however there has been a few years ago.